Hawaii has many, many bananas. Anyone who has ever lived here can attest to the bounty of banana trees that permeate the yards and gardens of the islands. Banana trees are incredibly low maintenance to grow, but they are high maintenance to maintain. They grow prolifically in the mineral rich Hawaiian soil, full tropical sun, and Pacific rains, which is exactly the challenge of attempting to tame them – they get big, bushy, and can take over if you’re not careful. Most households with banana trees also have their banana tree machete to keep the trees at bay, to chop down the bunches of bananas when they are ready, and to hack away the trees that are past their prime. We used to have banana trees of our own when we first moved to Maui, but now we are just the happy beneficiaries of the fruits of our neighbor’s banana tree labors. This abundance of bananas explains Hawaii’s abundance of banana bread recipes. 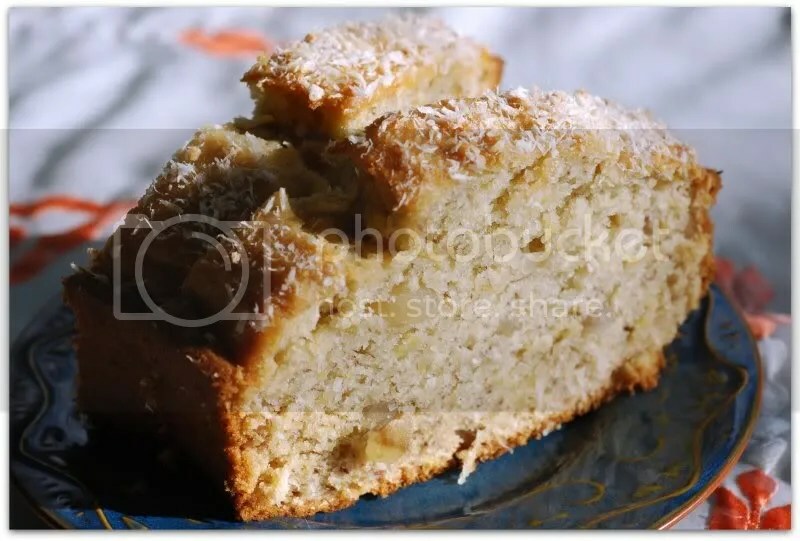 As you drive along any rural road in the islands you will encounter numerous road side stands and shops selling auntie’s or uncle’s homemade banana bread – guaranteed to be the best in the islands. Everyone has their favorite. Over the years, I have amassed a large number of banana bread recipes in my recipe binder and I happily have plenty of opportunities to try them all out. I made this bread last week when we were gifted with a large bunch of bananas from our friend who lives next door. It has a particularly tropical flair due to the addition of coconut, lime, and macadamia nuts. It was adapted from an old Cooking Light recipe. If you want to take it a step further and dress it up for dessert, you can quickly whisk together some confectioners sugar and lime juice to create a glaze to spoon over top of warm slices; garnish with coconut and sliced mac nuts and – voila! – fancy dessert. Personally, I like mine plain and simple, but I will warm up a slice in the microwave and smear a bit of warm soy butter over it to enjoy for breakfast before skipping out the door to work. The beauty of banana bread, in my opinion, is in its versatility. 2. Combine the flour, baking soda, and salt in a bowl and set aside. 3. Cream together the soy butter/margarine and sugar with a mixer, then add the oil and mix until well combined. Add in the banana, soy yogurt, rum, lime juice, and vanilla and mix until blended. Add the flour mixture and mix at a low speed until just combined. Stir in the coconut and macadamia nuts. 4. 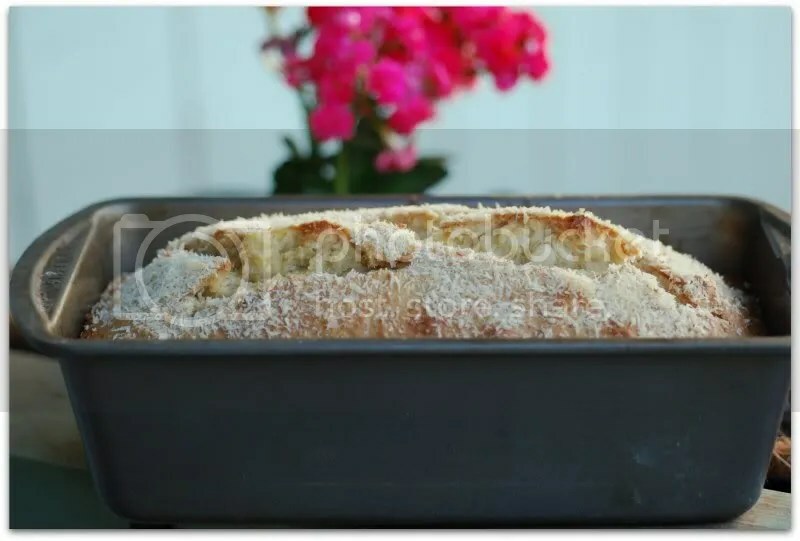 Pour the batter into a 9×5 inch loaf pan coated with cooking spray and sprinkle the top of the loaf with the extra flaked coconut. Bake for 50-60 minutes, until a wooden toothpick inserted in the center comes out clean. 5. Cool for 10 minutes in the pan on a wire rack before removing from pan. If you are a fan of banana bread give this recipe a try. I, living in Hawaii for many years, have sampled hundreds of banana breads and this is my all time favorite. Super ono! I have some bananas I’ve been waiting to make into banana bread and I think this might be the recipe I try! I’m so sick of the same old loaf and your island twist sounds scrumptious! Wow! This sounds like the most amazing bread I ever heard of. MUST FIND MACADAMIAS! 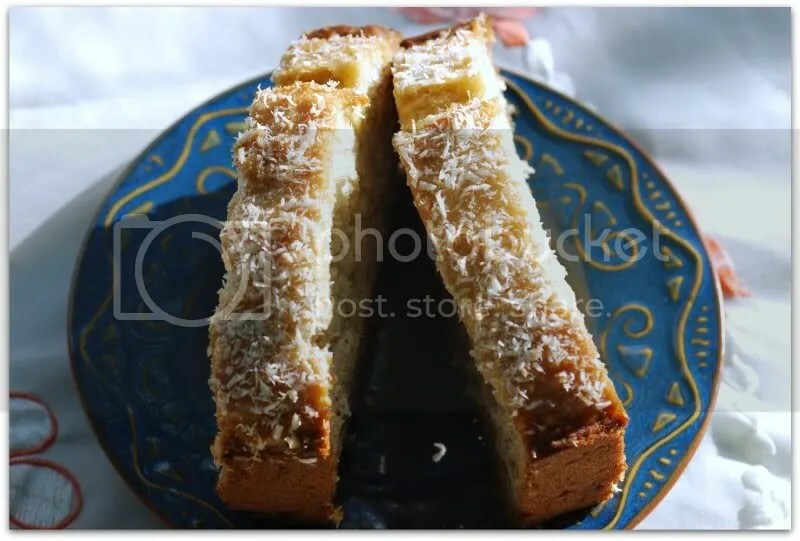 I opened Google Reader this morning, saw your post and just had to make it (although I left out the macadamia nuts because I don’t like them and used brown sugar, so mine doens’t look as pretty as yours). Oh my yum!!!! It’s is 6am after a night of waking up 5 times between 12:30 and 5:30 (at which point I surrendered and stayed up), and I am exhausted and very hungry. 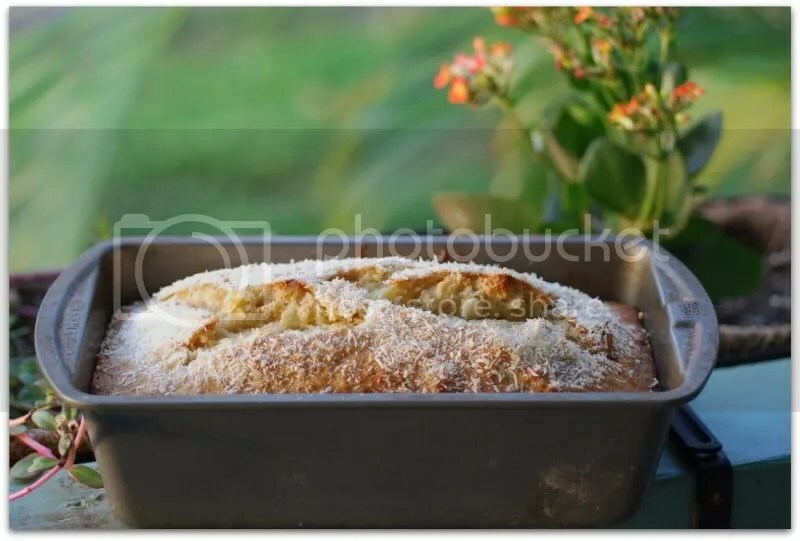 Opening up your blog and seeing that bread made my tummy rumble! I will be making that soon! Wish I could just raid your kitchen and eat some of yours right now. Thank you, everyone, for the kind words. Sanja – I’m glad it turned out so well for you! I am sure your loaf was just as pretty. This looks amazing. I’m a little behind on my blogging, and boy am I glad I didn’t miss this. I still haven’t done my DB challenge, but this may be what I make this weekend anyway. Or maybe I should try it tomorrow.